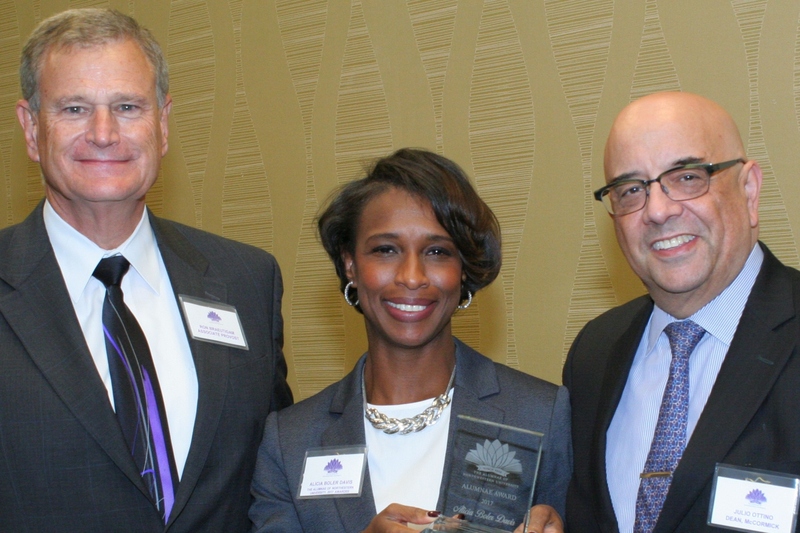 Alicia Boler Davis, 2017 Alumnae Award Recipient with Ron Braeutigam, Associate Provost, (left) and Dean Julio M. Ottino, McCormick School of Engineering and Applied Science (right) at the November 9 Presentation and Reception. Alicia, a graduate of McCormick, is the Executive Vice President, General Motors Manufacturing. Her responsibilities include manufacturing engineering and labor relations. She is a member of the GM Senior Leadership Team and the GM Korea Board of Directors. Boler Davis, who holds a bachelor’s degree in chemical engineering from Northwestern University, also received a master’s degree in engineering science from Rensselaer Polytechnic Institute, and an MBA from Indiana University. She began her GM career in 1994 as a manufacturing engineer at the Midsize/Luxury Car Division in Warren, Michigan. During her career, she has held many positions of increasing responsibility in manufacturing, engineering, and product development. Previously, Boler Davis was senior vice president, Global Connected Customer Experience at GM, where she led the company’s connected customer activities, including infotainment, OnStar, and GM’s Urban Active personal mobility initiatives. She now leads about 180,000 employees at 171 facilities that manufacture tens of thousands of cars, trucks, and SUVs every day. In her role as chief of labor relations, she interacts with all unions representing hourly workers around the world as partners in driving employee engagement – a difficult task with 45 different unions representing hourly workers in 31 countries. Numerous organizations and publications have recognized Boler Davis for her professional accomplishments and community service. Of note, in 2014 she was named Technologist of the Year by Women of Color magazine. In 2013, Fortune magazine named her one of the 10 most powerful women in the automotive industry In 2010, Automotive News included Boler Davis in its list of the 100 Leading Women in the North American Automotive Industry. She serves on the board of directors of General Mills, is a member of the Northwestern University McCormick Advisory Council, and a board trustee of the Care House of Oakland County, Michigan. Boler Davis also serves as Executive Liaison for the GM WOMEN leadership board.